What do you do with the letter I for goodness sake? This is the letter we are all to use for Alpha Bakes this month. Well there is icing of course, but that seems a bit of a cheat. Luckily Delia came to my rescue. I am doing a mammoth bake today (and yesterday) for a friend’s 60th birthday party. I was looking for a range of bakes with different colours and textures that could be picked up with one hand and eaten with minimum fuss and mess. Leafing through my newest cookbook, Delia’s Cakes, for inspiration, I came across her Iced Honey & Spice Cake. Perfect – a spicy dark cake would make an excellent addition to the birthday feast and it was an official “I” for iced because Delia said so! I upped the quantities, changed the method and added cocoa. I also added chilli for additional interest and because that is the choice for One Ingredient this month. I was recently sent some honey to try from the New Zealand Honey Co. and this seemed like just the right bake to showcase its distinctive oaky flavour. Melted 100g of NZ Beech Forest Honeydew honey in a pan with 140g unsalted butter. Sieved 275g of flour (half wholemeal spelt, half white) into a bowl along with 25g cocoa. Added 1/2 tsp cayenne pepper, 1 rounded tsp ground ginger, 1 rounded tsp ground cinnamon and 1/4 tsp ground cloves. Stirred in 100g caster sugar. Grated in the zest of a small lemon and a small orange. Chopped up some of the chunkier strands of my lemon marmalade (about 40g) and stirred into the flour to coat. Mixed a rounded tsp bicarbonate of soda with 4 tbsp water. Made a well in the centre of the flour and added 2 medium sized organic eggs. Mixed from the centre outwards, adding the honey and butter as I went along and finally the water. Spooned into a 22 cm sq (9″) cake mould and baked at 175C for 35 minutes. Allowed to cool, then turned out onto a board. Sifted 150g icing sugar into a bowl and added just enough lemon juice to make a slightly runny icing – about 1 tbsp. Spread this over the top of the cake. Placed a few pieces of crystallised ginger over the top then left to set. I did cut a tiny sliver off to try which I shared with CT. It tasted like a good spice cake should do with a little hint of chilli to liven things up. We both thought the honey gave it a distinctive and unexpected flavour which lingered on the palate; CT likened it to whisky and was all in favour. Fortuitously, this big baking session coincided with being given two dozen local organic eggs to try. I was very pleased to have this opportunity. Since losing both our organic shop and our shop selling local Cornish produce last year, I have been struggling to source the ingredients I used to use. I am still lucky enough to be able to get local duck eggs at our weekly Country Produce Market, but they are not organic. Penbugle Farm produces organic hens eggs to Soil Association standards and they are only three miles down the road from Liskeard – hooray! I will be doing a post specifically on this shortly, so watch this space. I is for Iced Honey and Chocolate Spice Cake. Alpha Bakes is a monthly challenge, hosted alternately by Caroline of Caroline Makes and Ros of The More Than Occasional Baker. I am a big fan of chilli and as Laura chose this as the theme for One Ingredient this month, I just had to enter. I was hoping to do a specific chilli bake; chilli and chocolate are just such a great pairing. But time is against me, so I’m hoping the addition of chilli to this cake will suffice. I am certain sure, it is an improvement. This monthly challenge is hosted alternately by Laura of How to Cook Good Food and Nazima of Franglais Kitchen. That sounds and looks wonderful Choclette. I haven’t made a cake like this in such a long time. Hope you had fun at the party. I’ve seen this cake in her books too and often wondered what it was like. Your alterations sound delicious! Great idea to use chili instead of ginger to add a warming spicey note. Just what we need at the moment with all this snow! I am all for adapting recipes and your choice of flavourings are so perfect. Spices with honey, ginger and chilli in the form of cayenne is fine by me. I have been impressed by the list of cakes you have made for this party and inly wish I could be there to sneak a few slices for myself! Have a great time at the party! That reminds me of some of the cakes I ate when I was just a little thing – although they didn’t have chilli in them. They sound really lovely. It looks lovely, kind of old fashioned and simple but with complex modern flavours. What wonderful pictures. These remind me of an old school fete. I can just taste that icing and the sweetness it adds to the crumbly cake underneath. Glorious! And a great i bake too. I love these kind of simple iced slices and honey is a favourite in baking. Gorgeous. I love the combination of chocolate and spice – there is always something so tempting about traybakes! 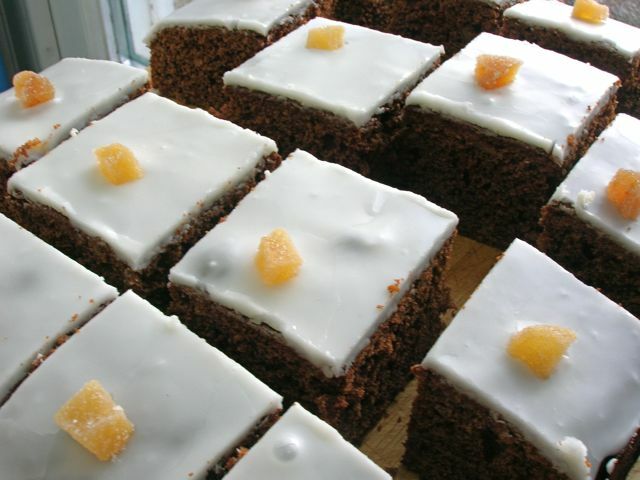 Looks lovely, comfortingly traditional but then with the spices and chilli to surprise when you actually eat it and all set off to perfection with a light lemony icing – gorgeous! Yummy! I love honey too! In fact I am addicted to it and I use it in most hot drinks instead of sugar. I have never made a spicy cake before and this post is quite inspiring. Very nice Choclette. These cake slices look so good Choclette. I love the sound of the flavours you’ve used. I am very lucky and have my eggs delivered weekly from a local farm – you can’t been fresh local eggs! As much as everyone is moaning about the cold snowy weather at the moment, at least it gives us the chance to hold on to wintery spice flavours in baking a little longer! Love the sound of chocolate with all the spices although I’m a bit of a wimp and would avoid the chilli. By the way I tried your passionfruit cake recipe from the Clandestine Cake Club book and thought it was absolutely brilliant. Love spicy cakes, and these look delicious. Looks lovely, thanks for entering Alphabakes! Anything with ginger in and I am there! These look so delicious, can’t wait to make them, yum!